I was a bit old to really have a crush on Danielle Fishel during her Boy Meets World years, but I was a fan. Seriously though, who didn't like Topanga? Fast forward 25 or so years and I got to meet Fishel at Wizard World Chicago. Danielle has grown into a lovely woman and better yet, she was so very sweet. I met her the first day of Wizard World, because I knew there would be a huge line for her and I wanted to get it done when I had a chance. Up close, she really is as cute as can be and just a delightful person. On a funny note, I actually saw her earlier on, when she was talking to fellow celebrity guest Mick Foley. Mick had made a guest appearance on Boy Meets World and the cast took a group photo with him. I talked to Danielle about her iconic role and the love she still gets from it. She is ever grateful for all of it. She also seems to get along well with her former costars, Ben Savage, Rider Strong and Will Friedel, who were also appearing and had adjoining booths. The Boy Meets World area was extremely crowded all weekend. The next day, I was wrapping up some coverage, when she recognized me from the previous day. She offered to take a selfie with me and I certainly glady accepted her offer. Below is the selfie that Danielle actually took. Check out WizardWorld.com for more info and schedules. You can also check here for recurring coverage year round. You can also follow Danielle Fishel on twitter. 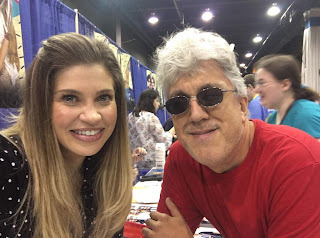 Danielle Fishel and me in Chicago, IL-August 2018. I always loved watching that show ... good to hear that the kids are still friends!